One look at Pyle’s catalog will point to similarities with GoPlus, one of their biggest rivals. Pyle is much more than another low priced metal detector brand. Years of refinement has made them a top company to buy hand wands from. And when it comes to full size metal detectors, they manage to keep up (and sometimes surpass) other brands in the industry. The PMD38 is a metal detector that you’re more likely to catch at security checkpoints. This includes school areas, government buildings and high profile businesses. It is a low cost solution to scanning people in the most non-invasive way possible. Depending on what you’re looking for, the low or high settings can detect all unwanted metallic objects, even the small ones. In quieter areas you can depend on the vibration mode or use the LED lights to alert the user of any problems. No major adjustments are necessary when changing between modes, and it is as cookie cutter as you would expect from a handheld metal detecting wand. 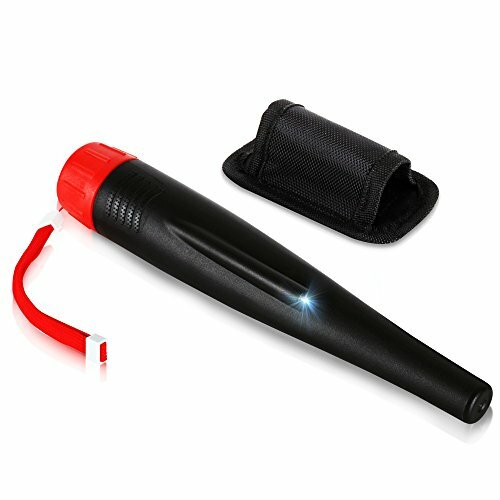 All of the features describe the product perfectly, so buyers that need a dependable handheld wand will have no trouble getting used to this one. The learning curve is small, and the actual product is under a pound in total weight. If needed, a security guard can have this wand attached to their waist for daily use. A single 9 volt battery is required for full operation, with low power used even when you opt for generic brand batteries. When you need a dependable wand metal detector without a high learning curve, then look no further than the PMD38 from Pyle. Next on the list is another handheld metal detector, the Pyle Pro Pinpointer. This is a more durable version of the PMD38 and is made for treasure hunting instead of security. The price is still low despite the extra features available in this version. Audio and sound vibration alerts are handled by the built in speaker so headphones aren’t needed for it to alert you. 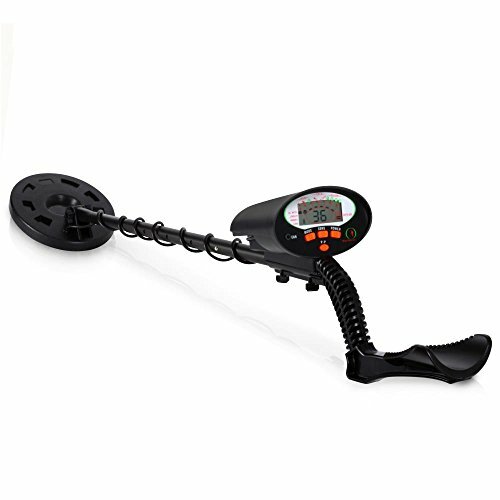 Sensitivity is around 3.5 centimeters which is more than enough to put this metal detector in the elite category. Nothing is complicated about using the device, and Pyle kept it as simple as pointing and waiting for the detector to react. The tip is submersible since this version of the metal detector is rated as waterproof. With its Marine Grade IP68 construction, depths up to 10 meters can be tolerated without damaging the product. Power issues will be a thing of the past thanks to an updated system that alerts the user when the battery is low. And to save power when not in use there is an automatic power off option that keeps even the worst batteries in great shape. Overall weight is well below a pound so it’s easy to attach this to your hip for a full day of treasure hunting. Four LED colors are available so that you can fully customize the detector to your liking. The Pro Pinpointer has everything you could ever want in a handheld metal detector and backs it up with a fantastic price. 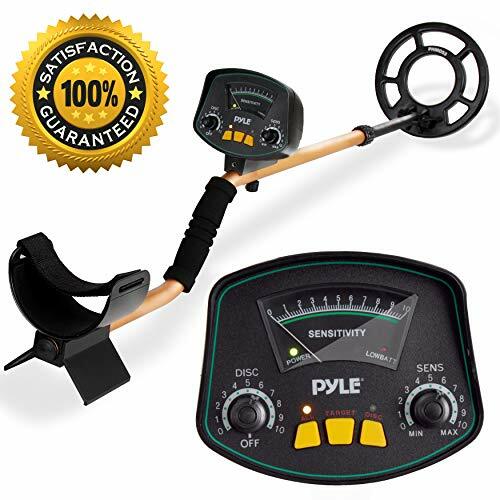 This is the first ‘full featured’ metal detector on the list for Pyle. It is a low cost option for customers that want the best experience when they are out looking for objects. There are five detection modes built into the device that serve to look for specific metals across different terrain types. The LCD display is huge, with nice sized buttons that are easy to identify. Pertinent information is shown on the screen at all times so that you know which model you’re operating in. 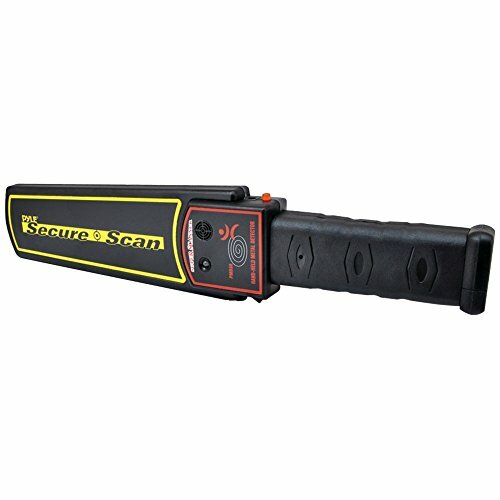 With a targeting detection ability that rivals more expensive metal detectors, this model does a good job in comparison tests that rank products based on their accuracy. Users can use the various height adjustments of the arm to get the most comfortable experience. The PHMD74 has quick and expansive arm support from its adjustable aluminum stem. Audio queues are handled by the built in speaker, with an option to use the standard 3.5 headphone jack if you want to plug in your own hardware. To make the most out of the detection when going over different surfaces, auto ground balance keeps things in check without needing user intervention. Depending on the smart AI of the device is the best way to get the most of it in short and long sessions. Six AA batteries are required for operation but won’t affect the low 3.35 pound weight of the metal detector. This is one of the best ground metal detectors from Pyle and it continues to receive solid support. The last item from Pyle is also considered to be their best, or at the very least a product that they’ve built on. The PHMD53 is where the PHMD74 got the entirety of its foundation. Sporting the same low cost, this metal detector is the one that truly started it all for this line of products. It can find objects like gold, jewelry, coins and silver with ease by using the pin-point detection ability. Instead of the flashy LCD screen that modern metal detectors use, the PHMD53 opts for the traditional meter design to find all objects. This is still one of the best ways to organize a busy screen without overwhelming the user, and it is accomplished without leaving out important visual cues. Six AA batteries are needed to power the unit, and they go a long way if you use a good brand. The power saving features of the PHMD53 are strong, but not enough to stretch out generic batteries. Out of the box there isn’t a lot of customizability other than the discrimination and sensitivity control. That makes this model great for beginners that don’t want to be overloaded with extra features. It’s also useful as a teaching tool for professionals that want to get students started with the basics of object hunting. The coil is 8 inches and waterproof, so a decent size that can cover a lot of ground for semi-skilled searchers. When you want to get a metal detector that has all of the basics down to a science, the PHMD53 is a great choice. Pyle is a company that was founded in the 1960’s, starting out with advanced woofers. Sometime around the year 2000 they completed changed how they did business. The current Pyle has split its resources into both the car and home markets, offering a variety of leisure and professional products spread across multiple industries. They equally service regular consumers and large businesses with powerful products under their respected brand name. Metal detectors is a winning market for the company, and they have made big strides in a crowded marketplace. If future iterations of their flagship PHMD53 continue to improve, then chances are they will be considered a top three company. All of the prices from Pyle are low, a feat that is hard to achieve since they have a large variety of products. They manage to please multiple types of consumers without spreading themselves too thin. But Pyle isn’t what people would call a ‘budget’ brand. They are as legitimate a brand as any of the big names in the industry, and it is that notoriety that keeps their customers coming back. Pyle is on a short list of companies that both normal consumers and professionals feel comfortable buying from. And what makes this even more amazing is that they don’t have what you would call a knockout flagship product. It’s great but will see many improvements with future generations as they improve on the formula. Pyle is known for two main things; Portability and sound. These are two qualities that you can be assured will be top notch no matter what model you choose. Portability – From the hand models to the full length metal detectors, the size is small but doesn’t cripple the usefulness of the product. Their hand wands in particular are light, and can be carried from a utility belt for most of the day. The full size metal detectors are some of the most comfortable available to lug around on long journeys. You can rest it on your shoulder while walking and barely realize it’s there. Speakers – The speakers on their metal detectors are quite good, at least when it comes to loudness of tones and beeps. You won’t have any trouble hearing it in areas that are busy or full or traffic. Customers that don’t want to use the 3.5 jack will appreciate the how well the speaker works compared to user supplied headphones. Pyle products are between 5-8 kHz, depending on the model and its generation. It’s not a powerhouse, but it gets the job done. Customers may notice that the information for some models is hidden away or sandwiched between a lots of marketing. Most competing brands that are double the price have the same stats, so Pyle isn’t hiding the kHz of their models. Frequency is important, but in reality it is only worth making a fuss about if it’s too low or if it is high enough to warrant a mention. Pyle products are average, and in some cases above average for what is expected on their side of the market. Pyle metal detectors are kind on power and their hand wands rank as some of the best in the industry. Even when used on active duty the hand wand metal detectors seem to last forever. If you choose a good branded battery, you can expect many months of use. Their full size metal detectors have similar performance, but have a need for good batteries in order to maximize performance. Full size Pyle products don’t play nice with generic batteries, although they will work fine. If you don’t want to recycle batteries at a ridiculous rate, then it is recommended to only go with branded batteries for their full sized metal detectors. Their design is interesting from a customer point of view since it really isn’t distinct. It’s hard to tell a Pyle metal detector from other brands unless you sit them side by side. The logo is a dead giveaway, however that is the only real distinguishing feature that stands out with their products. For professionals that don’t want fancy designs, this is great when they work outdoors and need metal detectors to blend in. For customers it is a little less exciting since the designs don’t try anything too fancy. Compared to competitors that lean professional with their design, Pyle can be considered casual. And in truth, it is the best ‘casual’ look out of all the brands available. This is the only downside to the entire Pyle brand, although it hasn’t affected them too negatively with sales. They don’t provide extras with any of their mainstream products, even if it is something as simple as batteries. So that means no headphones, covers or anything to sweeten the deal for a first time user. Entry level consumers are likely to get enticed by a starter set from another company because of this. Some of the products from Pyle come with a few things, so at the very least a few of their notable products contain extras. In the next few years it would be nice to see them make more starter kits like GoPlus and other competitors. Nothing to see here; Pyle products are average to above average in durability. The only complaint that people have made has to do with inserting the batteries into some of their products. It is a little harder than usual, and some cases have led to the user damaging the unit in the process by not following directions. If your battery is harder than normal to fit in, make sure to read the directions for important insertion information. This will save you the headache of having to call in the warranty before you even use the product. Pyle products last a long time in high use environments when they are maintained properly. Users have had no problems at all detecting objects on the ground with the full sized units. The handheld units are in a league of their own with great accuracy, even with well-hidden objects. Pyle’s hand wands are the bread and butter of the company, and are consistent over a single charge- more than many other metal detectors in its class. The main thing that attracts customers to the hand wands are their accuracy even when they are on low batteries. Pyle hand wands don’t suffer a penalty to their precision when the power is low. This is a game changer in emergency situations, and especially when using the product outdoors. Companies that are great on price usually provide an average warranty. Pyle differs from those brands by offering a full warranty, one of the better ones in the industry. It also helps that their products don’t break down when they are taken care of. Pyle products that are used without proper maintenance are guaranteed to break down. They aren’t like power tools that can be left unchecked for months, so a little care goes a long way in insuring stability. For all their metal detector models, a minor cleaning once a month should be more than enough to keep it in working shape. Buyers that need to contact the company will have no problem getting a live representative in minutes. They’re understanding, and when the correct information is presented they push claims through quickly. All of their products are on the smaller side, making them fantastic for portability. This includes the hand models and the full sized models for all terrain types. The lightness of a Pyle product will fool customers that hold it in their hands for the first time. Although their metal detectors are light, they are in no way made of cheap components. The hand wand can fit in a lot of glove boxes in cars or trucks, a handy feature for security personnel. These two companies often go head to head in sales due to their consistent low prices. GoPlus is recommended for beginners based on a lot of their mainstream products having extras. Like Pyle, they have consistent accuracy with good power consumption. Pyle is preferred for its larger scope in the metal detector market. Their hand wands are second to none, and in some tests their full sized detectors make better use of power when utilizing a filter. When you want a product that has everything included get GoPlus. For long-term solutions for all levels, Pyle is the better choice. There is always room within the marketplace for companies that have low priced metal detectors. Pyle satisfies more people than the average value company. They are a solid long term investment for normal consumers and professionals that need consistency.